Its easy to forget that summer lasts until September 21st and that even after summer is officially over, plants carry on blooming, growing, making seeds. And that’s exactly what they’re doing right now at my house. My cosmos, zinnias, strawflowers are tumbling over one another, blooming wildly. I’ve given up caring about the general tidyness of my garden and just let them go. Larkspur seeds rain down from dried pods, and I just hope I can remember where to expect them to pop up next year. 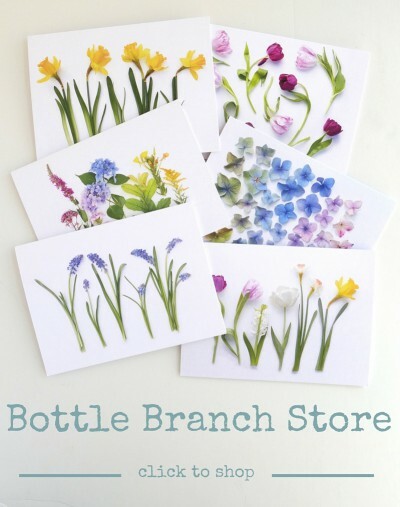 Stepping through fallen leaves and gathering blooms is one of my favorite activities this time of year, so I’ve made some flower arrangements (above) and some cards for my Bottle Branch shop. (below) In fact, over the summer (and since my lost post here) I’ve added 11 new card designs, as well as a new style of flat cards. I hope you’ll go take a look in my shop to see what’s new; I’ll be adding even more in the coming weeks. And in the mean time, enjoy this magical seasonal transition and the rampant abundance of fall flowers. Thank you so much, Joan! I so appreciate your kind words and knowing that you’re reading. And yes its been a while (almost 6 months!). AND.. yes to colonial williamsburg! so much fun to visit!